Moving to a new city can be exciting and overwhelming. Your Lane’s Moving relocation team is here to ease the stress so you can get on with your life with minimal disruption. We will customize an intrastate (moving over 50 miles within the state of Ohio) moving plan that covers all of your needs. Your Personal Relocation Consultant will help you understand liabilities and manage the cost of your move from packing and storage to the hauling of your vehicle. We are here for you from beginning to end to ensure you have a stress-free move. Lane’s Moving & Storage is registered by the Public Utility Commission of Ohio (PUCO) and adheres to all state and federal safety standards. Whether you’re moving to the next town over – or across the state, we’ll guide you through the intrastate moving process and ensure a seamless transition to your new home. 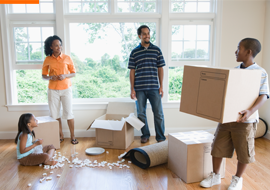 Planning an intrastate move? Contact Lane’s Moving & Storage for a free estimate. Also, be sure to check out the FAQ’S page to learn about the quoting process.